If purchasing or renting from companies other than Pearson, the access codes for Pearson's MyLab™ & Mastering™ products may not be included, may be incorrect, or may be previously redeemed. Check with the seller before completing your purchase. The 8th Edition uses the BouncePages image recognition app (available at no charge on both iOS and Android stores) to connect students’ digital devices to the print textbook, enhancing their reading and learning experience. Lutgens/Tarbuck’s innovative SmartFigures feature has been expanded, adding new digital content via Project Condor, Mobile Field Trips by Michael Collier, Animated Figures, and additional tutorial videos from Callan Bentley.This edition also includes Mastering Geology, the most complete, easy-to-use, engaging tutorial and assessment tool available. 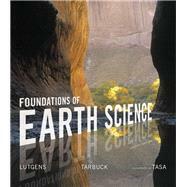 Foundations of Earth Science , 8th Edition is also available via Pearson eText, a simple-to-use, mobile, personalized reading experience that lets instructors connect with and motivate students – right in their eTextbook. Learn more.